At a news briefing on crime stats Monday, Chief of Detectives Robert Boyce said finding her alleged killer was like looking for "a needle in a haystack"
New details are emerging about how police tracked down the 20-year-old suspect accused of murdering a young runner in Queens last summer, abandoning her strangled, beaten body in a marsh in what became one of the city's highest profile crimes in recent years. Ray Villeda reports. Karina Vetrano's beaten body was found Aug. 2 in a marshy park in Queens. 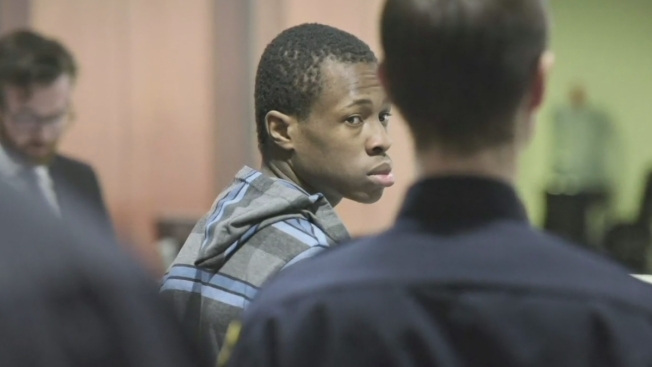 Prosecutors say Chanel Lewis confronted, attacked and strangled Vetrano while she was jogging. Lewis is charged with second-degree murder. If convicted, he could face up to 25 years to life in prison. New details are emerging about how police tracked down the 20-year-old suspect accused of murdering a young runner in Queens last summer, abandoning her strangled, beaten body in a marsh in what became one of the city's highest profile crimes in recent years. One of the lieutenants investigating the August death of 30-year-old Karina Vetrano remembered reports of a strange man skulking around Howard Beach, where the young woman often went running, and asked an anti-crime detective from the 106th Precinct to review his notes, authorities said Monday. The detective came up with a name: Chanel Lewis. On Thursday, detectives went to the Brooklyn home where Lewis lives with his mother and asked for a DNA sample to rule him out. Lewis complied. Two days later, on Saturday, forensic results showed Lewis' DNA matched some of the samples taken from various investigative points on Vetrano's body. The 20-year-old man was taken into custody that evening. Law enforcement sources say they also clothing collected from Lewis' home in East New York, including a hat that may have been worn during the attack. He initially didn't speak with detectives, nor did he ask for an attorney, law enforcement sources tell NBC 4 New York. Around 5 a.m. the next morning, the sources say Lewis told one of the detectives, "I want to make things right." And, according to police sources, Lewis twice confessed on video, once with the NYPD and the other time during an interview with the Queens district attorney's office. "The defendant admitted to attacking the victim, admitted to beating her, to strangling her and dragging her body in the weeds," Queens District Attorney Michael Curtis said Sunday. Police have released new surveillance video showing what may have been Karina Vetrano's final moments on Aug. 2 before she was found killed near her home in Queens. Lewis did not, however, confess to sexually assaulting Vetrano, according to police. Vetrano's body was found Aug. 2 in Howard Beach. Detectives secured more than 600 DNA samples and sifted through over 250 leads from the public and 1,700 investigative reports over the course of their six-month investigation. At a news briefing on crime stats Monday, Chief of Detectives Robert Boyce said finding her alleged killer was like looking for "a needle in a haystack." Lewis had no prior criminal record -- only a series of summonses, including for urinating in public and being in the park after dark in Brooklyn. None of the summonses were received in Howard Beach, sources said. The lack of criminal history made it particularly difficult for investigators to zero in on Lewis, Boyce said. "Difficult cases take time but you don't stop," he said. Mayor de Blasio praised the NYPD's diligence. Lewis, meanwhile, is being held without bail after his arraignment Sunday on a charge of second-degree murder in Vetrano's death. Lewis has two attorneys through Legal Aid. His father described him as a "humble kid" who was a good student and wanted to go into social work. Vetrano's mother, Cathie, had harsh words for the suspect at his court appearance Sunday, nearly six months to the day her daughter's body was found. "He's a demon! He's a demon, he can burn in hell," Cathie Vetrano said. The young runner's father, Phil Vetrano, who spearheaded a grassroots social media effort to keep her name in the media, was among the search crews who found Vetrano's body. He said Sunday he was at a loss for words, but thanked police for their investigative efforts in solving his daughter's case. "We hoped to get to this point, one day," he said. "I am not going to say it's good, but we can move forward now. We are in a place we were never at, we know who did this." Lewis faces up to 25 years to life in prison if convicted. Authorities believe he snatched Vetrano near an area connecting the remote Howard Beach route she jogged to an East New York bicycle path that runs along the Belt Parkway in Brooklyn. Police said they don't believe he and Vetrano knew each other prior to the crime.